I’m having (whoopee!) an actual launch party in London on 13th February, on the eve of The Night Rainbow’s official publication date, but not everyone can be there, so I’ll be doing some virtual mingling over the next couple of weeks with some very smashing people indeed. I’m hoping it will be like being at a party on the web, where you wander around chatting, you meet some new people, ask some questions, have a bit of a laugh. And all this without having to wear heels. So come on in, help yourself to a drink, and I hope you have a good time! Kate at For Books’ Sake, where we talk about the portraying pressures of motherhood and how long a story should be. Jen at The View From Here literary magazine, who asks me what are the important things, and where did the idea of a night rainbow come from? Roz Morris, about the Undercover Soundtrack to The Night Rainbow – the songs that were part of its making. Jen Campbell – Bookshoppist and author, who I may have made happy-sad. Isabel Costello on her Literary Sofa, where we talk about the pleasures and challenges of writing in a child’s voice. 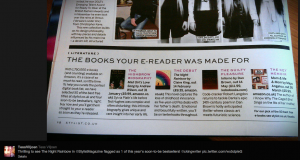 Alison Bacon, who asks about my experience of the publishing process with a top publisher, as well as life on twitter! Chris Mosler over at Thinly Spread, who has things to say, and a giveaway! 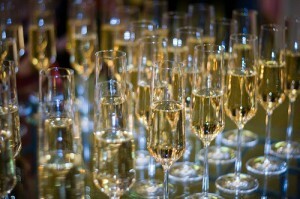 and other people too…I hope there’s enough champagne. 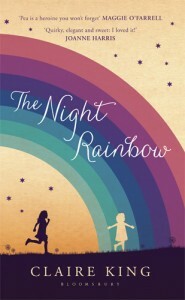 Marie-Claire selected The Night Rainbow as one of their top reads for the month. 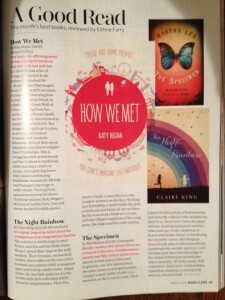 Good To Know magazine have listed The Night Rainbow as one of their 2013 book club picks (alongside Jodi Picoult, Yann Martel and Jojo Moyes!). If you post a review here you could win an e-reader. See more reviews on this page. I’ll update the page with links as they happen. For mingling in person, please see my events page here. Here’s a good question related to the post above: would you rather be ‘the next Maya Angelou’ or ‘the next Dan Brown’? Excellent question. If I had the choice I would rather be the next Maya Angelou. I understand that this means turning down immense financial rewards, but I think the words of Maya Angelou will live on for much longer, giving generations of people hope and inspiration. Ah I wonder if the time will come when Dan Brown wishes he was the next Claire King! Good luck with the launch and have the most fantastic time. Two years is a hugely long time to wait but I imagine it went remarkably fast and the actual arrival of the day you thought would never come is probably a bit of a shock! Aah thanks Gillian! Yes you’re absolutely right, it’s a very odd timewarp feeling after two years of trying to be patient and then all of a sudden it’s now, and if I’m not careful I’ll blink & it will be over and done with.